As you research your options in age-restricted 55 communities in and around Daytona Beach, Florida, you will discover that Bear Creek has the kind of amenities you’d expect to find in a luxury resort – and plenty of them – for a surprisingly affordable price. After all, Bear Creek boasts not one but three clubhouse-and-pool complexes, each designed to cater to the needs of older adults seeking an active lifestyle in retirement. Ours is a gated community nestled in the shade of stately oaks, only minutes from world-renowned beaches and a short golf cart ride away from a golf course and country club. Indeed, our ideal setting alone makes Bear Creek stand out among age 55 communities in the Daytona Beach, FL, area. Every home has a garage, carport, or utility room. Every home has a patio, screen room, or Florida room. Every home’s lawn is appropriately mowed, a service provided by Bear Creek staff. In short, Bear Creek is one of those age 55 communities you’ll be proud to call home. 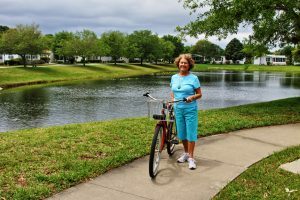 The best way to see how we stack up against other age 55 communities near Daytona Beach, FL, is to schedule a tour. Contact one of our friendly Lifestyle Consultants today for more information.